Many parents swear by timeouts, and a significant percentage of pediatricians even recommend their use. Indeed, with a young child, a timeout—or the threat of being sent away—achieves its purpose. Children’s fear of separation is primal, and can scare a child into becoming will obedient. But while timeouts may work in the short-term, they come with a significant long-term cost. • Timeouts covey to the child that we cannot handle them unless they’re good. Children need confident Captains of the ship to help them through life’s difficult lessons. 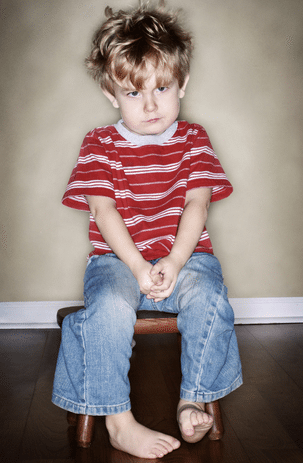 When we send a misbehaving child to his room because we can’t handle their misbehavior or moodiness, we’re effectively “jumping ship”, creating anxiety in kids who need to believe that we can handle whatever challenges they face. • When children are out of control, what they need most is the calming presence of a parent who will help them develop the language to appropriately express the big feelings they’re experiencing. Children who are sent away to “think about what they’ve done” do not think about what they’ve done. They either stew in their hurt or anger, or figure out ways to get out of the Timeout, either by lying and promising to “never to do that again,” sneaking out of their room (triggering more power struggles with the punishing parent), or learning to act remorseful without actually feeling remorse. • Timeouts trigger deep abandonment fears. The most profound punishment in a tribe is to expel or shun a member, casting him out if he has done something wrong. Timeouts are the equivalent of shunning, and can terrify—or harden—a child who is dependent on a parent’s presence and protection. The use of Timeouts triggers clingy behavior in children, escalating their anxiety about being left or rejected. When timeouts don’t work, it is usually for one of two reasons. Either the child has become so angry and hurt about their use that he acts as though he doesn’t care if he’s sent away. Or he repeatedly “escapes” from Timeout or refuses to go. Some parents become so frustrated by their child’s negative response to timeouts that they escalate their efforts to force the child to stay away, going so far as to physically carry the child to their room, or locking them behind the door. This generates enormous panic in the child. Rather than engaging in this kind of dramatic power struggle and conflict, parents should use other strategies that don’t alienate or harm the child, while still providing clear expectations for behavior, and outlets for managing upset with the parent’s help. I am especially concerned when I hear that timeouts don’t work because a child doesn’t care if she’s sent to her room. In this case, it’s crucial that parents heal the damaged connection and restore trust, while creating a climate for their child to express pain, hurt or anger around overly harsh punishments. No parent is perfect, and we all resort to less than ideal parenting strategies when we’re at the end of our rope. But generally speaking, it’s best to learn discipline techniques that work (and there are many) without creating the problems caused by using timeouts.